It’s the editor, not the writer, who whips the book into shape. It’s the editor who identifies what’s working and what’s not working—and helps the writer bring it all together into a saleable, publishable work. Today I’m thrilled to announce to our blog readers that Shawn Coyne’s much-anticipated book, THE STORY GRID What Good Editors Know, is on sale at Black Irish Books. On Friday the book goes out to the wide world via Amazon.com, B&N.com and other outlets. But for the next three days, readers of this site get it at steep discounts—and get extra bonus material too. Watch the video. It’s Shawn and me explaining the book and the deal. 2. Don’t have an editor at all—and thus have to be our own editors. THE STORY GRID is the product of twenty-plus years of Shawn’s work in the publishing trenches. It’s the system that he evolved after reading thousands of manuscripts, etc. etc. all the hell that editors go through in big-time New York publishing. The Story Grid has saved me. 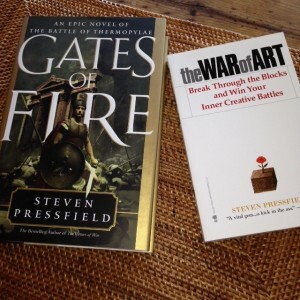 Shawn used it to turn Gates of Fire (which was 800 sprawling, incoherent pages when I first gave it to him) into a bestseller. He used the Story Grid to do the same for The War of Art, which was also a mess in its original form. And he’s done it on virtually every other book I’ve published. They don’t teach what’s in THE STORY GRID at Harvard. You won’t learn it, even working at Random House. THE STORY GRID is a must-read, must-have, killer piece of work. There’s nothing like it out there. Okay, okay … I’ll stop. Watch the video, view the special offer. Everything you need to know is in there. And thanks again, everyone, for following this blog and for following Shawn at www.storygrid.com. Congratulations, Shawn! It’s so nice to see the book out. I’m looking forward to reading it. I fall into the second category. It’s truly been a “master class” over on the Story Grid site for the past few months. Shawn gave much of the book away to those of us who showed up every Tuesday and Thursday for his posts, and he answered all of the questions we threw at him too – unmatched generosity! Congratulations! I am thrilled for Black Irish Books! Both blogs are a true education. Shawn looks like a proud papa on the video and with good reason! The community that resides in this space is dynamically changing us all. May traditional education take notice. I can’t tell you how much I’ve learned from the both of you. And while Thank you doesn’t seem enough, I say it again and again. Thank you, Thank you, Thank you! I know how you feel. I wonder at times why I was so fortunate to find this site. Steve, Shawn, Callie: The Trifecta of Creation. And don’t forget Jeff Simon, our web/design/tech maestro, who makes it all come together! I’ve had the privilege of the tiniest of geekery chats with Jeff as well. Indeed, a fearsome foursome. Y’all inspire the kind of emotional connection I usually reserve for my musical heroes. The selling point for me was when I found out that the Grid can be applied to non-fiction as well. If we humans are mainly different from other species just by the ability to tell and listen to stories-which allow us to forego instant gratification in search of the sublime-then the ability to tell stories is THE supreme skill. Think of what proper story crafting can do in conversations, in business presentations, in love. Game changer, I’m sold! Intuitively, I believed that long before Shawn suggested it. Still, his leap into Gladwell felt much like Niagara, a wire, and a wheelbarrow: the terror and the thrill. Great imagery, Joel! I got dizzy for a second. I studied 20min from the Falls and every time I saw them I’d be astonished by it all. Shawn is onto something big, I feel special being “in the know” from Day 1. Bought it. Reading it. Thanks!! Already purchased – and can’t wait to slowly dive into this incredible opportunity. There IS hope for me yet…I’m learning from the master(s). Thank you for making yourselves available to the rest of us. And, of course: Congratulations and much success to you. Bought mine first thing Monday. Thanks to Shawn for putting his hard-earned knowledge out into the world and to Steve for sharing it with us. And thanks, too, for offering the print book and the ebook together AND for giving us three different formats for the ebook. Time to read (and take lots of notes).